SIP Trunk Port Number | 8x8, Inc.
Plus, more features are available using our phones, such as mobile VoIP, and SIP trunking is the technology that facilitates such usage. In this article, we will illustrate some history about the different phone services and touch upon the importance of SIP trunking and what a SIP trunk port number is. The analog phone system is the oldest type of telephone service and was an essential means of communication for businesses and individuals for decades. Analog communication is the first generation of phone communication service built on copper wire. It is a reliable service, with clear voice quality and a dedicated copper wire per phone line. The copper wire usually is a direct cable connection from the telephone service provider to homes and offices. Businesses used old PBX analog phone systems by connecting dedicated copper wires to each telephone extension inside the premises. The connectivity to other people’s phones is carried by a specific number of analog phone lines through the telephone service provider, which means those finite set of lines limit the number of maximum external simultaneous calls. With the analog phone system, connecting two offices requires the exact number of phone lines as the maximum number of simultaneous connections. The second type of telephone services is the digital phone system model (digital PBX). It is an analog PBX phone with support for IP telephony and IP services. Also known as a hybrid phone system, it integrates old analog feature phones with new services based on IP networks. Digital phone PBXs are more modern, engineered by vendor-locked design structure for extending features and unlocking functionalities. In other words, it is a closed system structure that does not allow adding hardware from other vendors. The transition from analog to digital is not a huge change, as it is dependent on boards inside the PBX cabinets for expansion. Boards are added to analog PBX to integrate IP telephony. Digital phones are distinguished from analog through some functionalities such as music on hold and VoIP. They are “hybrid PBXs” due to their engineering structure that combines software-based IP networking with vendor-locked hardware (proprietary boards). A desktop client is a common component of advanced digital PBXs. Special features on some advanced digital PBXs support alarm systems by adding special purpose add-on boards. Advanced digital PBX can work without traditional copper wiring. They provide flexibility for additions, moves, extension changes, and virtual connections to desktops. However, they are not native IP PBX. The third and current telephone system type is the software-based IP phone. Everything is managed by software to deliver and receive voice and other services over IP. A software-based IP PBX is 100% independent of copper wire connections to communicate. It is a service over an internet connection or within an enterprise IP network, whether the connection is through cable or via mobile. Management and configuration of software-based IP phones can be done with just a few mouse clicks to connect or relocate a phone number and phone extensions. Voice quality is better than analog, if not the same. IP-based PBXs feature voicemail and call forwarding options, along with advanced virtual auto attendants. They also natively integrate with many call center systems and CRM software. To take advantage of internet-powered phone systems, the path forward is to integrate your old phone system with a software-based IP system. Whether you want to expand your current analog or digital PBX or you want to take advantage of mobile technology through your current legacy PBX system, you will need SIP trunking integration and a SIP trunk port number for each connection. They work regardless of the type of session or media used, allowing for flexibility. SIP is an open standard and supports multi-vendor integration. SIP messages are clear text, making troubleshooting easier. SIP can also accommodate multiple users with differing capabilities (some can be on voice and others can be on video in the same conference call). In a conference call that has some users with video capability and some with audio-only capability, the video users can see each other. They do not have to drop down to audio-only, as with other protocols. SIP trunking enables PBXs to send and receive calls via the internet and handle multiple applications at the same time. A SIP trunk port number is used to communicate each different service between the phone PBX and other applications (e.g., voicemail, video call, virtual desktop phone, etc.). SIP is the VoIP technology and streaming media carrier through which internet technology service providers deliver IP phone services and unified communications to customers. Beyond video and voice, most unified communications systems provide a full suite of modern features on-demand like streaming media, desktop sharing, group web conferencing, and virtual whiteboard. Software-based IP PBXs offer a superior upgrade path and more advanced features for integration with existing and future business systems such as CRM, messaging, and social networking. 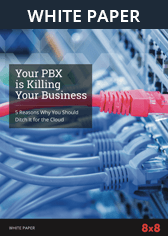 Your cloud software-based PBX provider and available features set directly affects your relationships with your clients, which directly affect your business' bottom line. Choose a superior cloud system and ensure that this effect is for the better. Fill out our online form today or call us at 1-866-879-8647 to request a no-obligation quote from an 8x8 Product Specialist.